Since acquiring it nearly three years ago, we have been making a continual effort to keep up with maintenance on our 36-foot diesel pusher bus; a 1987 Beaver Marquis, the High Tech Classic edition, bus #514 produced that year by the now extinct behemoth company, Beaver Motor Coaches. Although the Beaver brand name has been bought and sold several times over the last couple of decades, the quality that went into building our coach and that Beaver brand was long ago left behind when the RV Industry collapsed in the 1990’s. When things do occasionally break on our bus, our policy is that we fix them, or get them fixed, as soon as possible. We don’t let them pile up. 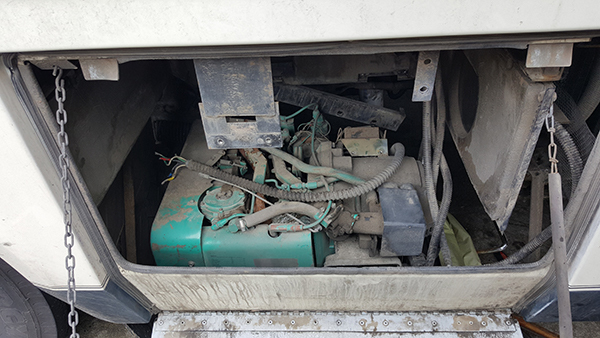 For example, we recently had to get our Onan generator repaired (by the family-owned business of Coumbs RV in Olympia, WA) when the starter gave up the ghost after 31 years of service. Onan LPG Generator on its way down and out of the bus. The generator works fine now, but John Coumbs (the Younger) had to completely remove the thing from the bus to fix it because the geniuses at Beaver Motor Coach left them no space at all for accessing the starter on the generator. There was simply no physical way to access the starter in situ, even after dropping it down on its hinged mount. Which meant the younger Coumbs had to disconnect all the generator’s wires from a junction box under our bed in order to have enough wire to extract the thing through the bottom of the bus. You can see the end of those wires in the photo above, at left. However, the next day after Coumbs RV got our generator working perfectly again (YAY!) we discovered an entire leg of our interior power plugs had become non-functional. I suspected it might be because John Coumbs (the Elder) (who connected my generator back up to its junction box at the end of the repair process) had perhaps gotten some wires crossed in that under-bed junction box, in his hurry at the end of a long and tiring day. Or maybe it was because I put a screw through a wall behind which there might have been some Romex wiring? Or or or …. Marie and I mulled over half a dozen plausible theories and possibilities. We also recently had some service work done in Port Angeles by MyRVWorks.com, which is a one-man operation featuring Darren Koepp, whose expertise and first love is finding and fixing electrical malfunctions. So we figured we would wait a week or two until we got back to Port Angeles and we’d have the repair of the electric plugs done by him. We strung an extension cord from a working circuit to power our many USB chargers in the interim, and waited it out until we were back in Port Angeles. It took a few days to line up an appointment with Darren (he’s a very busy guy), but I’m so glad we waited! Darren had the right tools to pinpoint exactly where the short was – 9 feet back from the farthest-forward plug. Which meant it had to be directly above the driver-side wheel-well, inside a plywood riser box that covers the fiberglass wheel-well. Sure enough — he dug into the plywood box and viola! There was the short. The wire looked like it had been punctured ages ago. It appears that when the bus was being assembled in 1987, a workman put screws through the buried Romex wiring, stripping the insulation off of one of the live wires, then pulled the screw out. 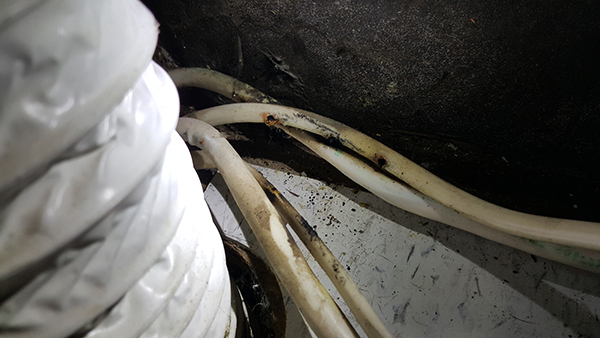 It took 31 years for that stripped live wire to finally spark and make contact with the ground wire, but that is what created the dead short on that leg of our electric plugs. So this short had nothing to do with the generator repair by Coumbs RV or the junction box under the bed. I was very glad that the Coumbs RV work was NOT at fault. I liked those guys and would use them again. Nor did it have anything to do with my putting a screw into a wall on the other side of the bus. Nor anything else on our long list of possibilities. Darren provided the tools we needed to look at things we don’t normally see. Magic! We’re behind you all the way. Well all the way to our exit anyway. Thought you’d enjoy a photo from our point of view. 🙂 Send me a reply and I’ll send you a picture of you on hood canal bridge. Perfect day to cross. If you’re still behind, a picture would be great! Would love to see the picture! PS: Would love a recent picture of you two posted on your site here.